“We thank Dr. Sohel (Sohail) for sharing his knowledge on hypnotherapy with our students of yoga therapy (medical students) here so they could elaborate the field of alternate therapy, in which Dr. Sohel (Sohail) discussed about the application of hypnotherapy in different ailments like Anxiety, depression, insomnia, confidence building and lifestyle disorders, where we can use it as a tool. In these sessions students could understand the basis of hypnotherapy and importance not only in therapeutic way but at personal level. 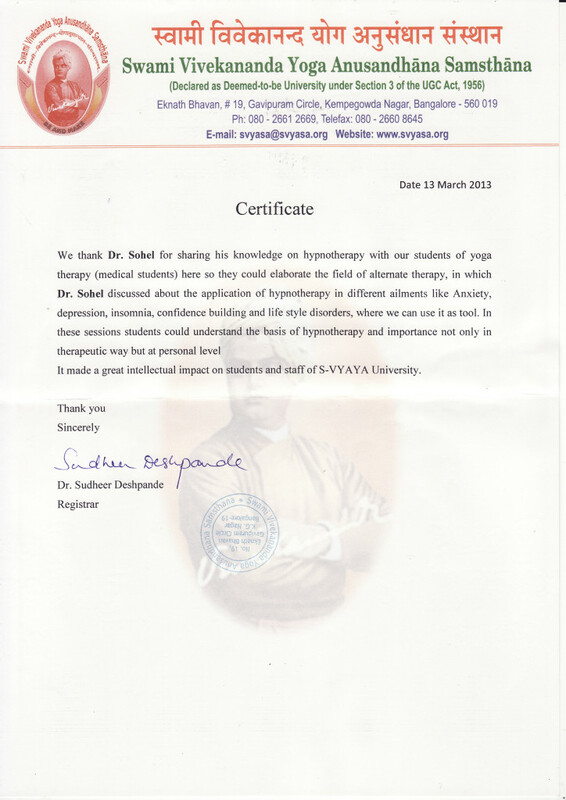 It made a great intellectual impact on students and staff of S-VYAYA University.